NYC Bagel and Sandwich Shop Supports Breast Cancer Awareness! Breast Cancer Awareness Month (BCAM), also referred to in America as National Breast Cancer Awareness Month (NBCAM), is an annual international health campaign organized by major breast cancer charities every October to increase awareness of the disease and to raise funds for research into its cause, prevention, diagnosis, treatment and cure. The campaign also offers information and support to those affected by breast cancer. Breast cancer awareness month is a yearly campaign that intends to educate people about the importance of early screening, test and more. This campaign starts on October 1st and ends on October 31st every year. NYC Bagel and Sandwich Shop show their support every year by supporting Breast Cancer Awareness. In particular, the Carol M. Baldwin Breast Cancer Research Fund. Each year, all NYC Bagel and Sandwich Shop locations “Turn Pink.” From the pink shirts available for all franchisees to the beautiful pink bagels. The staff wears the pink shirts and has the pink bagels to choose from during the whole month of October. 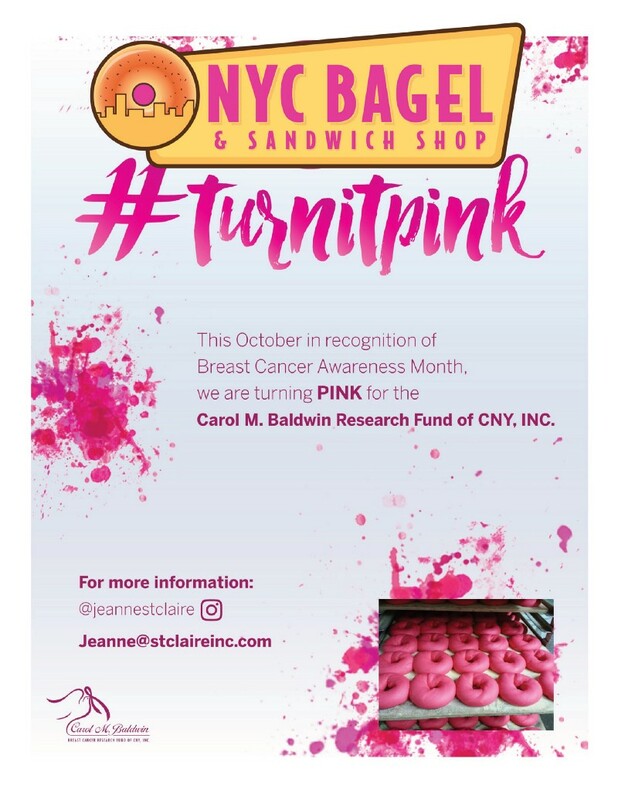 Each year, a portion of the pink bagels gets donated back to the Carol M. Baldwin Research Fund to show the support of the NYC Bagel Franchise. Curious about the Carol M. Baldwin Breast Cancer Research Fund? What is their mission? The Carol M. Baldwin Breast Cancer Research Fund, Inc., supports both new and established researchers investigating the causes, prevention, and treatment of breast cancer. This research will include — but not be limited to — studies of the genetic, molecular, cellular and environmental factors involved in the development and progression of breast cancer; application of the knowledge thus gained to educate medical professionals and increase public awareness for the prevention, detection tends and treatment of breast cancer; and studies of the outcomes of breast cancer detection and treatment on the patient, their families and society.